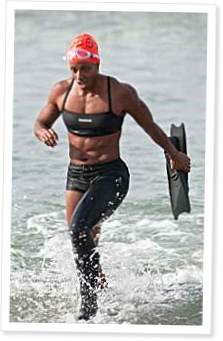 Deborah Cordner Carson successfully battled lymphedema and a fear of water to win the Spirit of the Games Award at the 2012 Reebok CrossFit Games. Andréa Maria Cecil reports. Tyler Quinn lay in his bed, hanging on to every word announcers Justin Judkins and Sean Woodland uttered. “I was in my room listening to the stream and holding my breath,” he said. Last year, the athlete withdrew from the Games in the opening event because of her fear of open water. The first event included an ocean swim near the Santa Monica Pier. Rich Froning overcomes all adversity and pressure to stand atop the CrossFit Games podium for the fourth consecutive year. He looked determined, almost angry. By matching strongman Rob Orlando in the thruster ladder, T.J. O’Neill helped the CrossFit Southie team place fourth at the Northeast Regional. Andréa Maria Cecil reports. Great article about a great person. I drop in at CF St. Paul quite a bit, and Deb seems to always be there, smiling warmly and helping people. Thanks cool. Good for her. I've seen the "fear of the unknown" before and it can be super intimidating.